SO YEAH! I CUT MY HAIR! Feels so refreshing! I feel like a mystical being in this long and flowing blouse with sheer sleeves. It has all the elements one needs to get her ethereal groove on. My friend at work said I looked very mod in it. I'll take that, too. Now that the weather is finally feeling like fall, I've been getting back into my obsession with my skinny jeans, and now it seems like I don't have enough. They look so good with my new Dr. Martens. A little bit of ankle showing never hurt anyone. I just saw this band play the other night, and I helped my friend Cheryl interview them for her blog mylifeinsound. They are basically my new obsession. And did I mention that they are all super cute? oh man i am digging the colour co-ordination here ;) everything is so matchy-matchy! it's fantastic. I really love your new hair cut (since I have the same one, ha ha ;)) and this shirt is cool! So excited about stocking my closet with a lot of maroon items. You look simply beautiful, and your new haircut is so cute. Beautiful boho outfit, so simple but so autumn-ish :) Love your new hair too!! The sheer fabric if the shirt and the necklace are great, love them! YOU'RE AMAZING. I LOVE YOU. and those shoes are pure perfection. Love the top and shoes so much! New outfit post - London outfit. your sweater is the perfect red wine color! gorgeous, love the color of the blouse. great top and I love the docs!! beautiful outfit and I love your hair cut! you look amazing! so chill and relaxed but that wine color makes it fantastically chic. i just am loving this color for fall! gorgeous top! 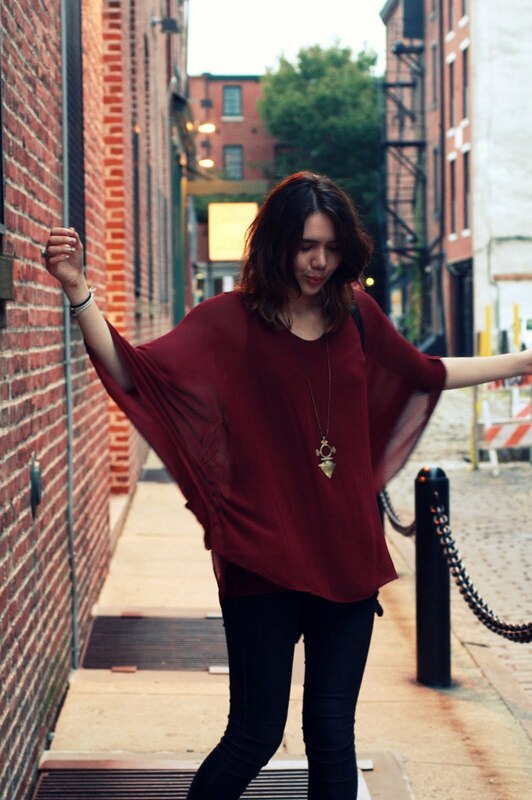 Definitely feeling the burgendy color-love the sheerness of this top too, beautiful! You look gorgeous! I'm in love with the colors in this outfit. I love just about every piece in this outfit. Especially the shoes! Love how the necklace goes the shirt :) And also the short hair really fits u! especialy love the top and necklace! Such a gorgeous top. I love the deep color of it, and the billowy fabric. So beautiful. Love your top so much, such a gorgeous autumnal colour. 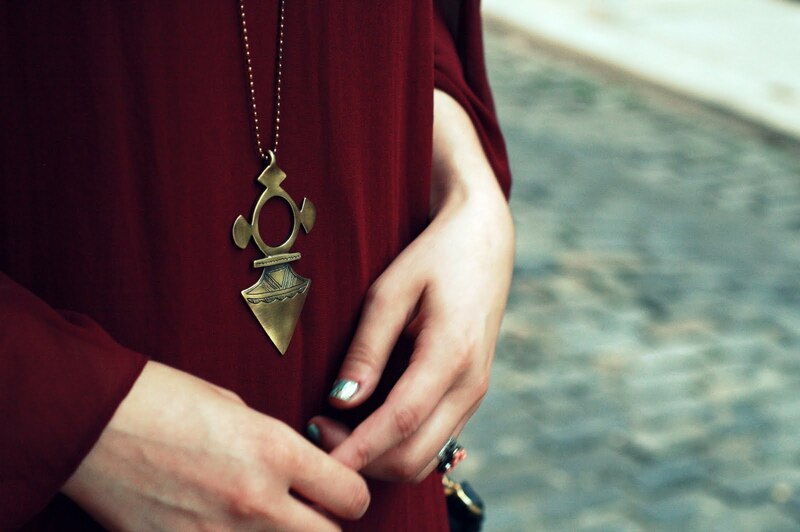 Beautiful necklace and love the silver nail polish too! I definitely adore the color of your shirt for this season. Superb. Loving the maroon and those are great loafers. Your blouse and necklace are gorgeous! Psst.. have you entered our giveaway for a Vintage Coach bag? So cute!! I love the colors of the top and shoes, theyre perfect together. Really love this look!! wonderful!! we are so much loving your top!! Finally a post with the short hair! You look amazing! I love your red sweater,is so beautiful! you look amazing in this color!! 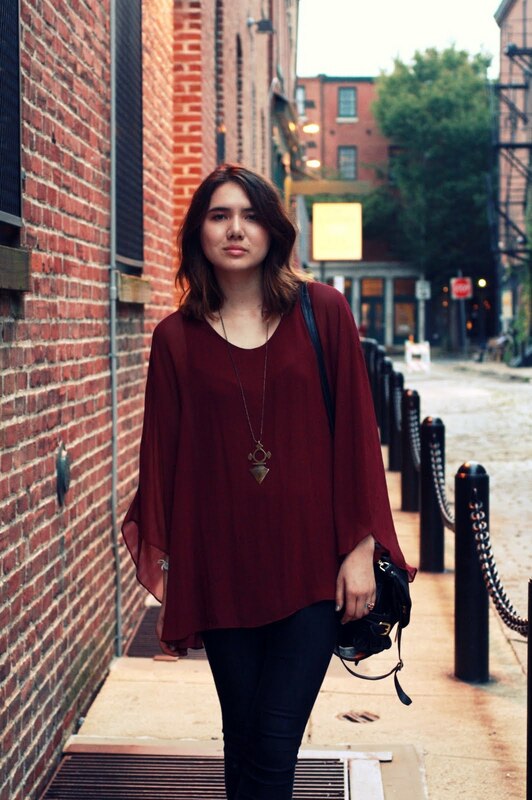 :) i need to stock more maroon in my wardrobe for this fall!! I love the maroon color, and it looks great on you. Great simple outfit! I really love your outfits, they are gorgeous, and so are you. Still, have you ever wanted to try highlights? Not that I don't like the way your hair is now! You really suit the dark hair good, also. I just think you would look suuper in some highlights as well. Love your top and definitely highlights your amazing necklace! I love the colour of your top. Wonderful outfit. Love the colour of the top! 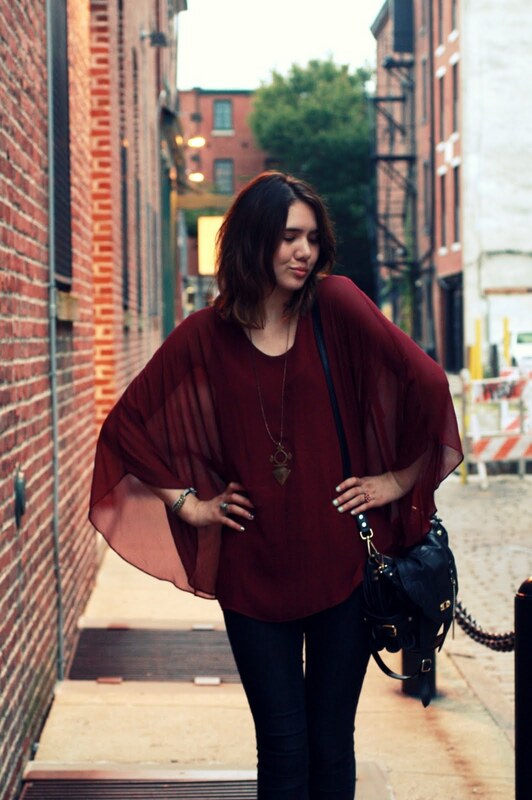 aw I love this look.the sheer maroon blouse and the skinny jeans plus the shoes just looks perfect. love the maroon.burgundy colors! the necklace is so unique! i really love this top too. its a perfect balance between comfy and chic! hope you had a great weekend! really love this outfit the top is lovely! What an amazing color! beautiful! I love your new hair style and your top!! Both suit you perfectly!! Some flight simulators may not even be accurate and can put you in real danger because you are flying a real airplane. That's why getting better is a very important thing to do. Please reply!! This outfit is just breathtakingly gorgeous. I love the colour of the top and the necklace is perfect for this outfit! I searched the entire Threadsence website for this top and couldn't find it. Is it from an upcoming collection?? 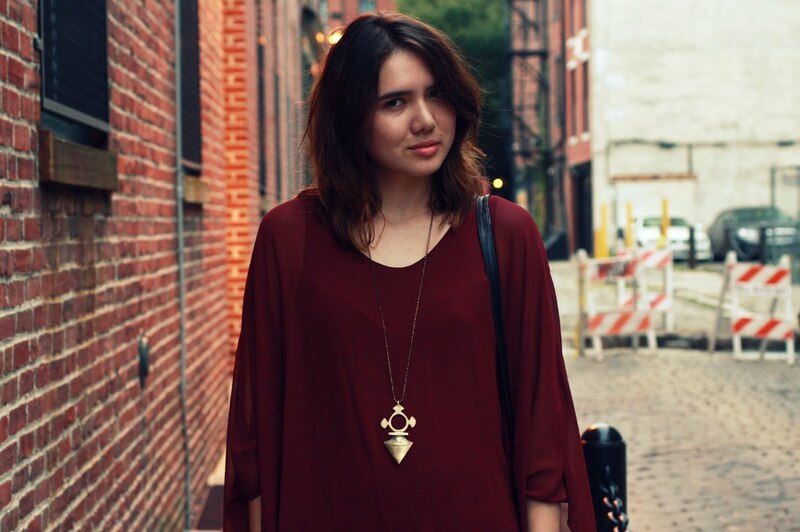 I've been looking for maroon and burgundy coloured clothing lately and your blog lately has been helping a lot! Thanks for your inspiration to us all!